The idea of starting a Magnetic Therapy business came about because of my lovely Chocolate Labrador Ella. Sadly, Ella was diagnosed with arthritis in her elbows when she was only 12 months old. You can read more about Ella’s story here. I cannot tell you the difference I saw in Ella and I just felt compelled to start up a Magnetic Therapy business. I was in full time employment working in International Sales so I was travelling all over the world but I just knew I had to start my own business. At the time I had my own horse Annie (who has since sadly passed away) but she was instrumental in helping me set up Equine Magnetix and was my chief product tester! I began selling a few magnetic products and started to receive really positive feedback from my horsey friends. That was all I need to get things moving, I just knew I had to launch the Equine Magnetix range. Within 12 months I gave up my job and went into the business full time and I’ve not looked back. We’ve been in business since 2013 and the feedback I receive from people is overwhelming. There are so many horses and ponies out there hugely benefiting from Magnetic Therapy. And, over the last twelve months I have more and more vets recommending the products alongside equine physiotherapists. 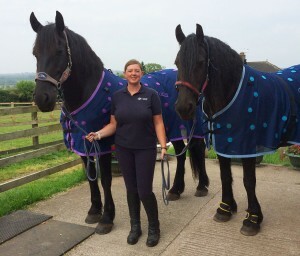 I know your horse or pony can live a more comfortable and active life, so whether you’re looking to use magnetic therapy for an injury or condition or simply as part of your daily exercise routine, it will be one of the best investments you’ll make. Most of our customer reviews can be found on each of the product pages on this website, in the blog area or on our Equine Magnetix Facebook Page. They’re all independent reviews from our lovely customers who have taken the time to share their feedback and I thank them sincerely. If you would like to get in touch email me (Sam) at info@magnetixtherapy.com or call 01270 584564. If I’m unable to take your call, please leave a voicemail message and I’ll call you back as soon as I can.